Course is full and registration is closed. The practical session for this hybrid course is sponsored by EWU's outdoor program, EPIC Adventures, and takes place on the EWU campus. Lodging: Numerous hotels in the Cheney and Spokane area. The Holiday Inn Express, 111 Betz Road, Cheney, WA 99004 is approximately 1 mile from the course classroom. Meals: There are several restaurants throughout town that can accommodate most dietary restrictions. Einstein Bro’s Bagels is located 1 block from the course classroom. They serve breakfast and lunch. Classroom: The class will meet each morning in Hargreaves Hall, room 119, to review in-class content and scenario SOAP notes, while the practical scenarios will occur throughout campus. See campus map for details. Parking: Parking in Lot P-12 is free except in the case of fee events; all other lots require a permit. 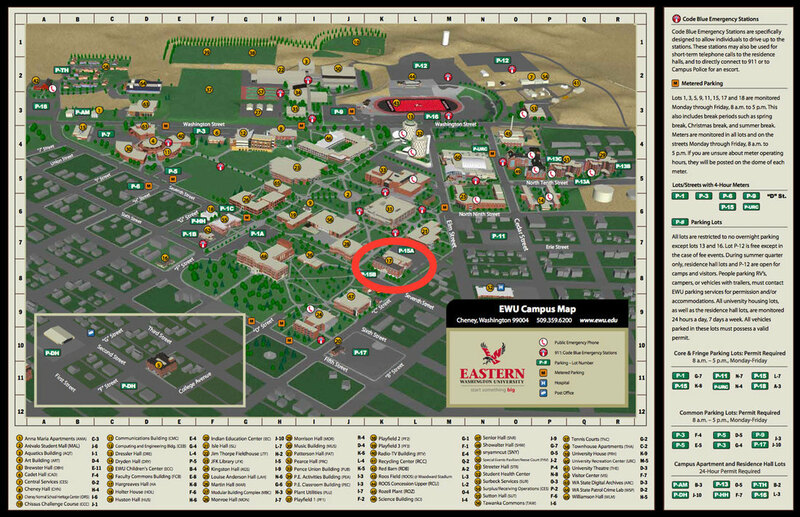 See campus map for details.